2nd book review on the topic. It was at a Confererence that I heard James Goll talk about how he prophisied to a man, repeating 23 times that this man was going to hell. Bill Wiese was indeed taken to Hell by the Lord for 23 minutes one night and came back so he could warn others and tell of this beyond-horrific experience. 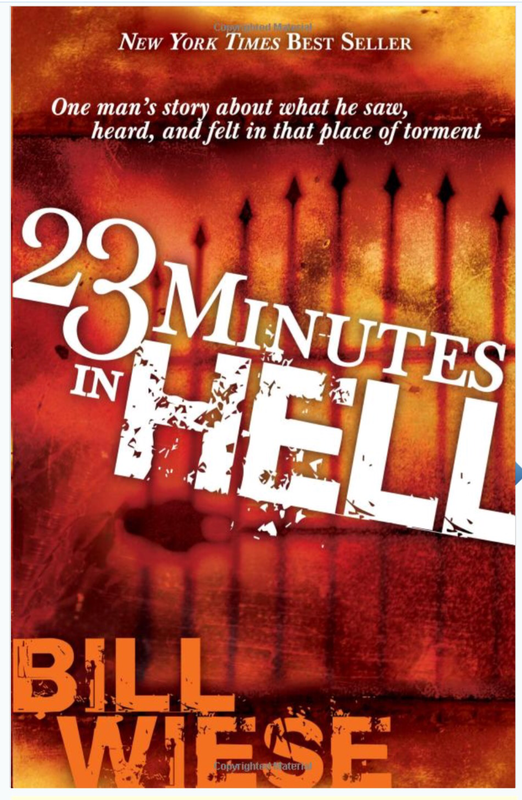 I was very curious to read his book 23 Minutes In Hell after having read Mary Baxter’s A Divine Revelation Of Hell and compare their experiences. No surprise! Both gave same descriptions. Our soul will still have a body after death. Where will you spend eternity after you die? We will still have our 5 senses which are more keen in the spirit world than in the natural dimension. Both Bill and Mary discribed the pits of hell as they saw it. Both experienced the torture and the pain. Then I saw that actually Youtube has several more accounts of people who experienced hell and came back to tell about it. And even so many still don’t believe Hell is a real place. This is baffling, seeing that in Luke 16:19-31 the rich man in torment in hell begs Abraham to send Lazarus back to his brothers to warn them of hell, to which Abraham replies that they have Moses and the Prophets to listen to. The rich man argues that if someone goes back from the dead, they would believe and repent. Abraham reassures him that if they are not convinced by the Prophets, neither will they be convinced even if someone comes back from the dead to warn them. And it is so! Still after these accounts of people who have experienced hell and came back to tell us, many still don’t believe it. One lady specifically told me: “You have to take those acounts with a grain of salt. All of their accounts are different, so…”. She does not believe in Hell even after reading some of these accounts. It’s like saying: “everyone I know who traveled to Paris came back with a different account. Therefore I don’t believe Paris exists”. Please people…. repent and escape Hell!